Is the Grand Prix Taking Boston for a Ride? By David S. Bernstein·	 6/5/2015, 12:06 p.m. Since Boston is already mired in a mud fight over whether or not the city can afford to host the 2024 Olympics, you might think Mayor Marty Walsh would be reluctant to take on any big, new, public sporting events. Not so. 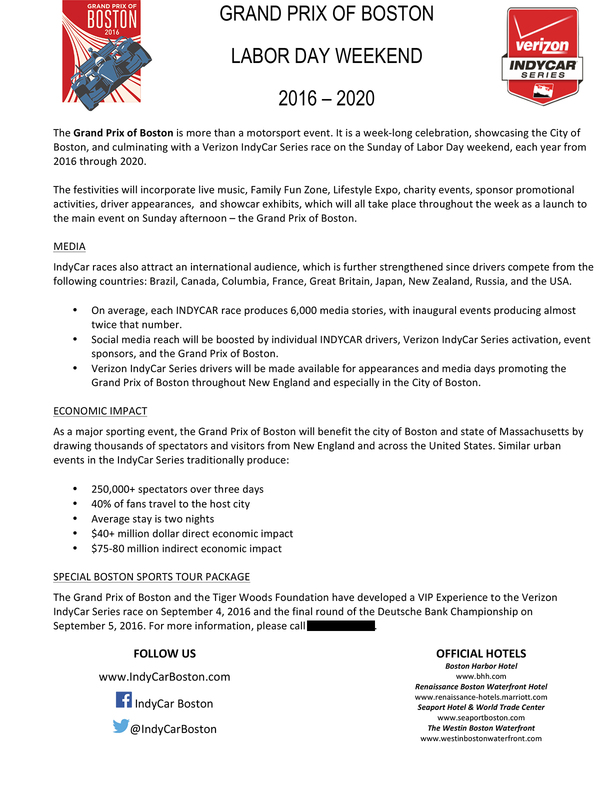 In mid-May, without public hearings, Walsh signed a Memorandum of Understanding with the Grand Prix of Boston, clearing the way for the city to host five annual IndyCar road races on the South Boston waterfront, each Labor Day weekend from 2016 to 2020. Speaking by phone on Tuesday, Walsh compared the Grand Prix to the Tall Ships display, which returns to Boston in 2017. “The economic opportunity is something that made me interested in it,” he says. It’s an interesting comparison, given Boston’s wild, sometimes comical, occasionally acrimonious disagreements about the economic value of the Tall Ships over the past 25 years. Those events either brought close to $1 billion to greater Boston, or were a net loss, or anywhere in between, depending on whom you ask. Surprisingly, Walsh’s memo with the Grand Prix provides no payments, subsidies, or other “linkage” in exchange for the use of Boston’s streets—while leaving City Hall on the hook for a fair amount of ancillary costs and inconveniences, which have the potential to balloon as the Waterfront finally blossoms and fills in with people and businesses. What’s even stranger is there’s a talking point going around that alleges the Grand Prix races will provide a trial run for Boston’s ability to host the Olympics. That’s ludicrous. In scope and scale, the two things are vastly different. But there are similarities in how the two events are being marketed to the people of Boston. Walsh, and Grand Prix of Boston, want to convince residents—as well as potential sponsors and partners—that the Grand Prix will be a huge financial success, bringing great economic benefit to the city, with little inconvenience. But under closer scrutiny, the details behind those claims start to get murky. It looks to me like the crowd estimates are being vastly inflated—and those are the numbers that are being used to project unreasonably high economic benefit for Boston. (More on that in a second.) What’s more, the Grand Prix effort includes people with close ties to Walsh. Grand Prix representatives held an informational meeting with South Boston elected officials on May 14, I have learned—a day after Walsh signed the contract. A meeting with Fort Point neighborhood residents wasn’t held until nearly a week later: May 19, the night before the news went public. In its community outreach, the Grand Prix has suggested that the event can be expected to draw at least 250,000 total spectators over the course of three days. That figure has entered media reports, in the Herald and elsewhere, as a prediction of Boston attendance. It has also reportedly been parroted by City Hall: Ken Brissette, Walsh’s director of sports and tourism, “believes the Grand Prix will bring 250,000 visitors to the city,” according to BostInno. And the 250,000 number was also included on a one-page sheet of talking points provided by the Grand Prix’s top executives, and currently being distributed within the travel and tourism industry. From what I can tell, that statement appears to be an unadulterated lie: The only IndyCar event that purports to draw 250,000-plus spectators is the iconic Indianapolis 500, which is not at all similar to anything like the event being planned in Boston. Kate Norton, a spokesperson for the Grand Prix, could not provide another example of an IndyCar race that draws those numbers. Before Norton was spokesperson for the Grand Prix, of course, she was Walsh’s press secretary. And the connections between Walsh and the Grand Prix don’t end there. Consulting work for Grand Prix Boston is being done by CK Strategies, which is also consulting for Boston 2024; Chris Keohan of CK Strategies was Walsh’s 2013 campaign strategist. Also consulting for the Grand Prix are Dino Difonzio, Dan Passacantilli, and Kenny Ryan – all with close connections to Walsh, mostly through his 2013 campaign. But back to the issue of how many spectators the Grand Prix could draw in Boston: Remember, since the Grand Prix isn’t paying the city for the use of our streets, the value the city gets is entirely dependent on how many people show up and spend money. Conveniently, the national IndyCar Series sanctioning corporation, Indy Racing League, does not allow attendance figures to be released—how’s that for a transparency issue?—but I have been shown marketing materials, intended for sponsors, that indicate the average attendance has been under 100,000 in recent years. The highest publicly reported attendance estimate I can find in recent years for a similar event—meaning a city-street IndyCar Grand Prix in North America—was 181,000 over three days this year at Long Beach, a 12-year high mark for that long-established event, which takes place in a massive market. Detroit hit a recent high of 110,000 last year; St. Petersburg had a little over 100,000. In Baltimore, which stopped running its Grand Prix after 2013—and which Boston is effectively replacing—attendance was around 130,000. Of course, Boston’s actual attendance might end up twice as big as those events, especially if some big ideas for accompanying events and activities come through. And, as Walsh and others told me, there are tempting promotional angles —for instance, Boston is slated to be the final event of the year, at which the Series champion will be crowned. But there is at least equal reason to expect Boston to attract smaller crowds than in those other cities. New England has virtually no native IndyCar interest: New Hampshire Motor Speedway, an hour north of Boston, last tried hosting a sanctioned IndyCar race in 2011, and canceled future plans after drawing just 28,000 attendees. Its two annual NASCAR races, by comparison, regularly get more than 90,000 spectators each on race day. What’s more, the timing of the event may not be helpful to crowd size. There is a good reason why Boston’s hotel occupancy is always very low over Labor Day weekend: Nobody wants to be in the city on the last gasp of summer. In fact, Labor Day weekend has been brutal on IndyCar attendance elsewhere. Last year’s IndyCar Series finale, at Auto Club Speedway in Fontana, California, saw attendance plunge from 40,000 in 2013 to 25,000 last year, after being moved to Labor Day weekend. If the Grand Prix’s claim of 250,000 total spectators doesn’t hold water, then it’s unlikely the economic benefit claims will, either. In that same one-page fact sheet I obtained, Grand Prix organizers claim that similar IndyCar events produce upwards of $40 million in direct spending, and $75-$80 million total, including indirect impact. The $40 million figure was repeated by Walsh himself, in a strangely credulous front-page Boston Globe story, as the benefit Boston can expect from next year’s event. 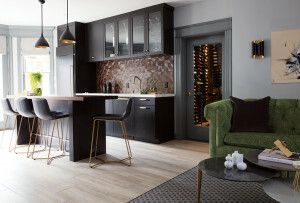 In the same article, Grand Prix of Boston’s CEO, Mark Perrone, gave the second, higher sum. One of the very few independent, post-Grand Prix economic impact studies available—in 2012, for Baltimore, the race Grand Prix of Boston is ostensibly replacing—found a direct impact of $24 million in 2012, with a total impact of $42 million. That’s barely half of what the Grand Prix of Boston info sheet claims is typical—which suggests some validity to GPB’s method of translating attendance into dollars: as noted above, Baltimore drew about half the number of spectators GPB says will come to Boston. From what Grand Prix of Boston has been able to share and discuss with me, including a fairly detailed 2006 Las Vegas economic impact study, I would say their methods are not entirely without merit. But they are ultimately projections based upon past estimates, adjusted by market assumptions. The projections aren’t based on or checked against actual results—and, since IndyCar doesn’t release even basic attendance figures, they are essentially impossible to verify anyway. Of course, the projections are all coming from people who have a strong financial stake in painting the rosiest possible picture—particularly right now, as they seek to land a title sponsor for the race. Walsh is not concerned; he says that, given the usual dead quiet of Labor Day weekend in Boston, the city and local businesses can benefit even from a much smaller turnout. “If the numbers aren’t 250,000, if they’re 150,000, I’d view that positively,” he says. “As long as we have a net positive earnings at the end of the day, it will be a success,” Walsh says. That would be an interesting story for the city to tell. But rather than speaking the reasonable truth, the organizers are making bogus, puffed-up claims that will only erode public trust and set people up for disappointment. They don’t need to create any additional headaches for themselves – they have enough given that the Grand Prix of Boston doesn’t have a firm deal yet for the Boston Convention and Exhibition Center, or for a title sponsor, among other pieces that must come into place. But as we’ve seen with Walsh’s Olympics dream, the headaches only get worse if Bostonians distrust the messenger.